September seems to have been a good month for breakdowns. On the 3rd I was spreading fertilizer when the tractor began to overheat. 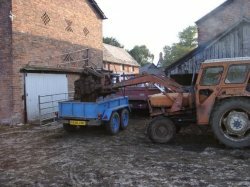 Checks on water oil etc showed levels at normal so it was limped to the yard. As it was due for its annual service the next day I did just that and on the resulting test run the engine seized up. 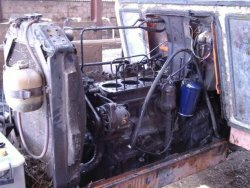 So Paul and I have stripped it down (see pic on right) and the crankshaft needs repairing (grinding as the trade call it). We suspect oil pump failure as the cause. 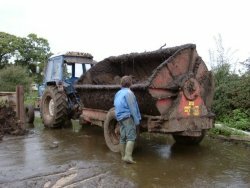 While on the subject of muck the picture on the left shows me loading muck for an expert local horticulturist John Carver. 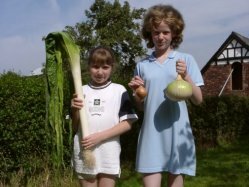 the righthand picture shows some examples of the vegetables he grows as shown by Sarah and Becky. 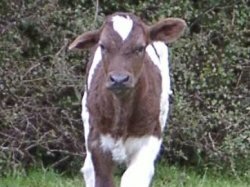 We have had 4 calves this month 1 Simmental bull and 3 Simmental heifers the last of which was born with this rather deformed ear. Although "One Hung Low" as we have called her is in otherwise perfect health the deformity means that she would have little value at the market. HORROR of HORRORS on the 12th Smidge was run over by a car. The driver didn't stop, but luckily Peter the assistant gamekeeper found her! At first I thought she had a broken back but a veterinary x-ray revealed a pelvis broken in 6 places as well as the top joint of her right leg. 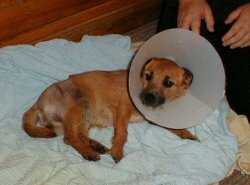 Part of the leg bone has been removed and she is now recovering in the house. Thanks to Mr Sales and his team at the Willows Vetenary Group for all their care. You can E-mail smidge@greenheyes.demon.co.uk if you wish to send a get-well message. The shed for the youngstock is progressing well and the block wall is nearly finished. I have also been repairing the water supply in the cubical shed this involved using a jackhammer to expose the water pipe. The last Wednesday of September brings one of my favourite days out, the Cheshire Ploughing Match click on the link to see a report. We have also been out on another visit with the NFU trailer and this month we went to Moulton pre-school. It was enjoyed by all, including James, son of our web boffin Andrew. 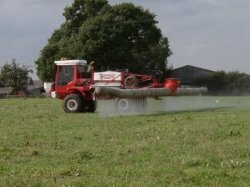 The weather has turned very wet this last week I am hoping that it will dry up as we still have 2ha of big bale silage to make and a grass re-seed to sow we have sprayed the field off ready for ploughing as this picture of the purpose made sprayer shows.